Finally getting around to getting a short report for this short race. I really didn't have this one on the schedule but back in February I won a free entry for it at the NCRC Volunteer Appreciation Dinner. I had a free spot on the calendar and it sort of fit in to my plans to build up for the 10k Finale to the Running Journal Grand Series on Memorial Day. I would use it as a combination fun run, workout and test of my fitness while hoping to bring home another age group win. This was the 10th year for the event which is normally a 5 miler but construction along the route caused a shortened version of the course this year. It is located in the Glenwood area and runs mainly through the residential old Raleigh neighborhoods. And it is hilly ! Very Hilly ! I was lucky to arrive early and grabbed a parking spot 1/2 a block from the starting line. It was a cold morning but looked like it was going to be perfect for racing. 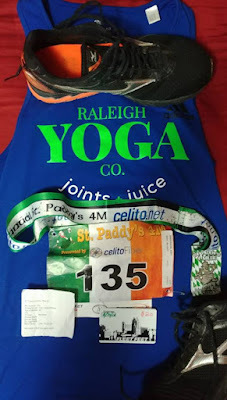 I picked up my race number and then sat in the car until I was ready to do my warmup. I ran around on the city sidewalks very carefully and slowly for my warm up mile and was feeling ok. Then as usual I did a series of short strides to gear the body up for race pace. This is a good size race with over 1,300 runners and I waited a bit late to line up and didn't get as close as I would have liked. Although its chip timing I didn't want to get behind a lot of slower runners and lose time weaving through the crowd.. I looked around but didn't recognize any age group competition and then we were off. I did have to do a little maneuvering around but not too bad and after a block we started up the first hill. My friend Rigo caught up to me and I thought he was going to hang around but after a minute he moved on ahead while I just focused on going as fast as possible without getting too far into oxygen debt. My goal pace for the race was 7:30 but I really wasn't sure that would be happening on this course so when I hit mile 1 in 7:28 I was feeling a bit more confident. And then there was mile 2. The toughest on the course. Other than a short downhill it climbed. And climbed. I was not thrilled and I had a few choice words as I begin to wonder if I would ever reach the 2nd mile. Finally it appeared just before the summit of the highest point of the race. I had slowed to a 7:54 and like that my cushion was gone. But I recovered quickly and mile 3 had some really sweet downhill so I gradually began to push the effort a bit feeling great. I still hadn't noticed anyone that looked my age anywhere around me. As we ran around Cameron Park I could see a lot of runners that were ahead and then as I went down the other side I could see a lot more behind me and still no one that seemed to be old ! If anyone got a jump on me at the start they were well out of sight ! I was able to make up a little time and hit mile 3 in 7:26. One more hill and then the last 1/2 mile would be downhill. Just maybe I could hit that 7:30 average pace after all ! I pushed up the hill as much as possible and then at the top I just put the hammer down and the zip was there ! A 6:53 mile 4 and boom, 29:37 beating my goal by 23 seconds ! I made my way over to the car to get my phone and check the online results which weren't working so I began walking over to the post race activities. Grabbed some water and eaded over to the results tent and there it was. Boom ! 1st age group out of 18. So, I was able to achieve all my goals for the day. Beat my average pace goal, had some fun , won my age group and got in a great workout.